I always have an elated feeling when I get to see the work of an emerging artist that is really promising. I fully subscribe to the words that I have said time and again: I never get bored or jaded of the art world, there is always someone doing something amazing. Zoe Buckman is one of those artists that elicited my curiosity and whose studio visit didn't disappoint. Nested on the top floor of an East Village townhouse, Buckman’s studio is bright and airy and feels energetically right. My first 10-second recognition overview glances primarily at one the neon pieces on the wall (it shows a pink placenta, even when the pictures here don’t tell 100% the truth about the color, it is pink) and Zoe, who is positively engaging, takes the placenta on the other side of the room (this one, her own which has been plasticized in Germany for a period of nine months and it’s now encapsulated around a heavy marble case) as the starting point of our time together. Zoe gave birth to her daughter, Cleo, three years ago and the childbearing and childbirth experience turned her into an anthropologist of sorts who started to look closely at the concept of mortality and the ephemeral nature of people and things. "It is that fleeting moment when something that is alive starts to perish", she tells me. These ideas also gave birth to a body of work that Zoe called “Present Life”, part of which was shown at Pulse this past Spring. 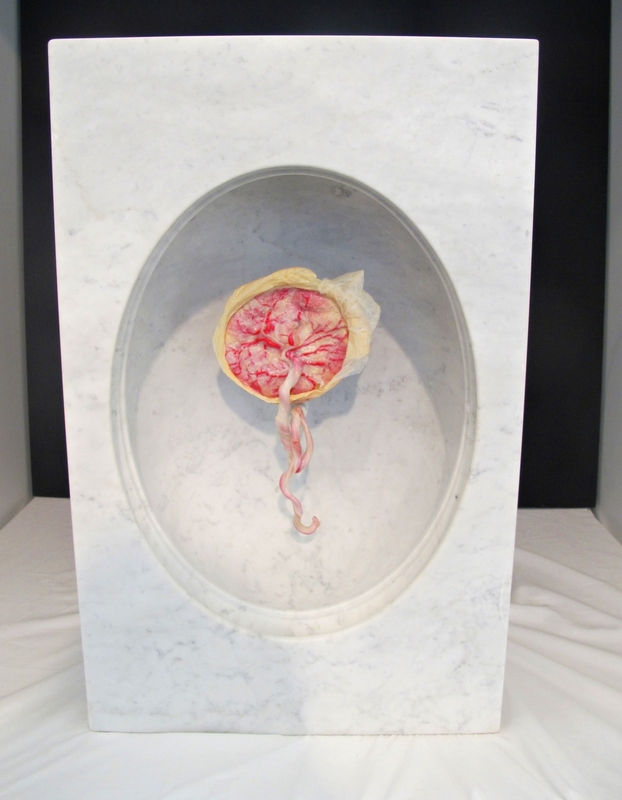 Alongside the two placentas, the real and the neon one, there is a series of reliefs engraved on concrete tiles, each of which shows different phases of a placenta that ends up disintegrating. There is also a neon sculpture that depicts an hourglass shape, as if reminding us of the inexorable passage of time. Finally, a series of six large-scale photographs where Zoe wrapped withering bouquets of flowers in black garbage bags are also a part of"Present Life". 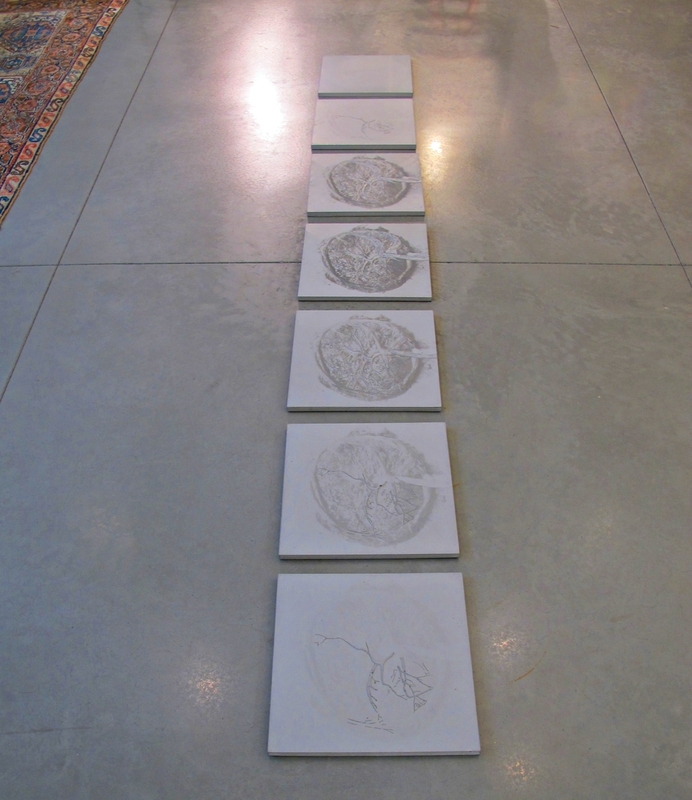 On the other side of the studio, a body of work entitled “Every Curve” is ongoing and growing. Hanging on a clothing rack, several pieces of vintage lingerie which Zoe has embroidered with hip hop lyrics taken from The Notorious B.I.G and Tupac Shakur (arch nemesis of the hip hop gangs from the East and West Coasts respectively and whose music informed Zoe’s upbringing in East London) captivated my interest. The lyrics are explicit and raw; the garment pieces are delicate and dainty. The contrast is palpable and smart and contradicts feminism while somehow using the pieces to create awareness and empower women. Zoe is envisioning this work as part of a large installation; she will create many more embroidered lingerie pieces which then will hang from the ceiling. With her enormous talent and bright disposition, I’m pretty sure that she will make it happen sooner rather than later. And I will be there to see it too.